Man, there has got to be at least 100 video games that bear the name Star Wars, so does the world really need another one? Apparently, it does. Of course, this one isn’t made for the big three consoles, but designed to connect to the television via the composite ports. You really have to use the Force to play this game, because it is completely motion-controlled. 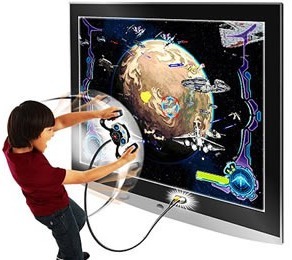 So now you can play like the kid in the picture and pretend the screen is an actual window and the controller is really controlling a starship. Sometimes you are the gunner in the game, and sometimes you are the pilot. I wish that this game was based more on the original trilogy rather than that Clone Wars sub-franchise that just refuses to go away. Even though the motion control might give the player a sense of realism, I have been told that the graphics are equal to the Sega Genesis. But it’s all good! Do we really need the coolest graphics to have the best gaming experience? Well, this might be a good gift for a Star Wars/Clone Wars fan on your list this year. It will cost about $30 and does not include 4 AA batteries.